In 2000, while living in Elk Grove, I finally got a confirmed name for the strange neurological sensations I’d been experiencing: RRMS, a disorder called Relapsing Remitting Multiple Sclerosis. I was looking for ways to deal with my new medical acquistion and I learned about equine therapy. Turns out horse riding is something beneficial when dealing with a disability. Enjoyable therapy? I had to learn more. Click here to open the entire article. Kate is a very smiley young lady, who was diagnosed with Cerebral Palsy when she was 3 years old. She began Horses for Healing and is growing to love horses. Kate’s favorite thing to do at school is paint (and any other type of art work) and sing during music time. She also enjoys dancing, and she loves to go to the park and play with her younger brother. As a family we do a lot of sailing, skiing, and we love to go to baseball games. We hope to get Kate skiing by herself this Winter. Syleana enjoys spending time with her Mom and Dad, her brothers, Noah and Colton, and her best buddy her dog Carter. Her priority in life is to keep meals and snacks served on time daily. She loves food as you can set your watch based on her internal clock! Over her childhood years she showed a high level of excitement over babies, dogs, horses and water. As parents we always wanted her to have her own activities, but felt it was important to include her in many of ours. She has tubed behind speed boats many times, been on snowmobile rides with her dad in a motorcycle sidecar, and has always loved horses. Horse riding became her specialty at a young age. What intrigued Syleana most about horses was looking at herself in the horse’s eyes. Getting face to face and seeing a reflection of herself from the large beautiful eyes of a horse. Touching the lips, smelling the forehead, or in her own way, bonding with this gigantic animal. 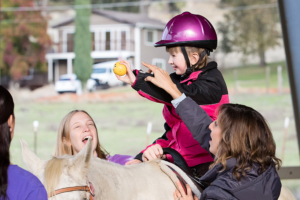 Today she rides at Horses For Healing weekly as this has been the one constant in her life. I hope she will always have this opportunity. If it weren’t for the many volunteers and gentle four legged giants, people like Syleana would miss an important connection with this world. Sedona has been riding at Horses for Healing for six years. 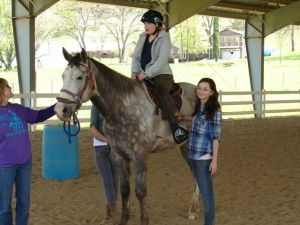 When she started, at age four, she was not walking independently yet and she had many anxieties around riding a horse. Instructor Marcy worked with us to find out what Sedona liked and found calming. By playing some of Sedona’s favorite songs during her rides and giving her some photos to hold (e.g. pictures of herself smiling), Sedona was distracted from her fears and started to have very happy and productive rides. She began to walk independently at age five, and her Mom noticed that after Sedona got of her horse, her gait became much more fluid and natural for an hour or so. Over the course of 6 years, Sedona has gained core body strength and improved her balance and coordination. She is now walking very well independently and sometimes even dances with instructor Marcy after her ride. In addition to the physical benefits, Sedona has gained cognitive and social benefits as well. When she first started riding horses, Sedona would not look the horse in the face after she dismounted, even though her horse was always very interested in her. Today she will smile and look directly at her horse, Scotti, and give her some appreciative pets. 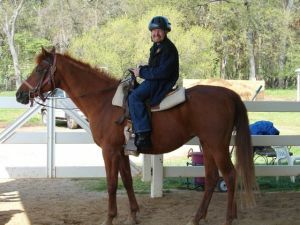 She also has made some beautiful and lasting relationships with some of the wonderful volunteers at Horses for Healing. Sedona can frequently be found smiling and laughing with her side walkers during her ride. Cognitively, Sedona has made leaps and bounds over the past several years. Today, we work on many cognitive games with Sedona during her ride. She does a great job of following directions, like when to turn and face to the side or backwards on the horse, or when to throw, pass or catch a ball. We have watched Sedona blossom over the past 6 years as a Horses for Healing client, and we look forward to her future accomplishments.